I’m thrilled to share this oh, so easy and very pretty cake plate stand! It can be used every day or like shown here for a special occasion. 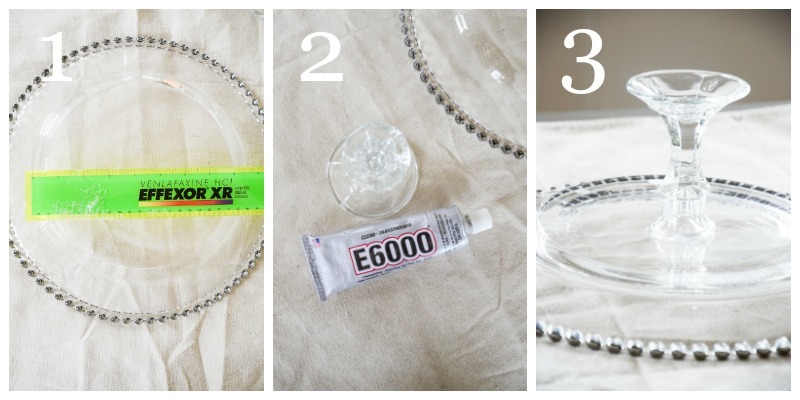 Not only is making this cake plate pedestal so simple it’s also very very inexpensive! If you like shopping for gems at places like Goodwill this DIY project might be a little addictive! How about making a very sentimental cake pedestal using a plate from your great Aunt Audra or Mom Mom Margaret. You can make large cake pedestals and mini ones too. 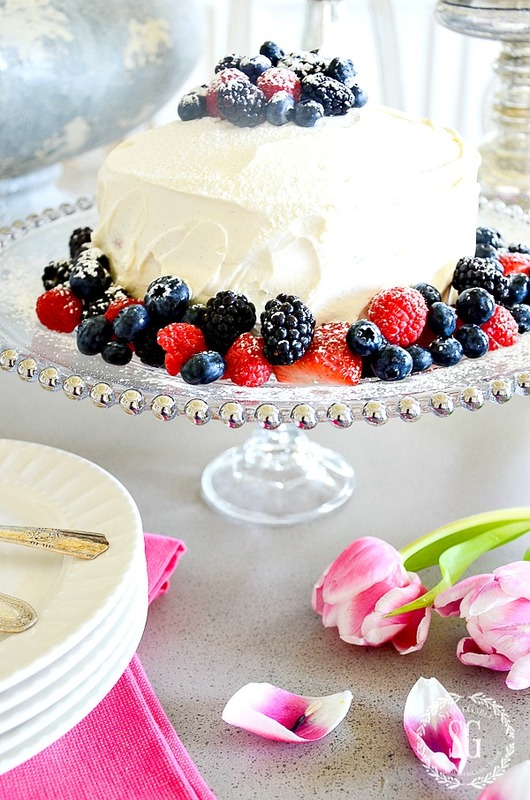 Let’s make a 10-minute cake plate stand! How pretty is this cake pedestal? It looks quite expensive but I have a secret… it was free to me! I found a glass candlestick and a pretty glass plate in my basement… and VOILA! With the right kind of glue, you have a stunning cake plate pedestal! Turn the plate upside down on a flat surface and find the center. 2. Add glue to the top of the candlestick at the point of contact with the plate. 3. Put the glued area of the candlestick to the center of the back of the plate. Let it dry (This does take more than 10 minutes) and cure. See the glue label for instructions. 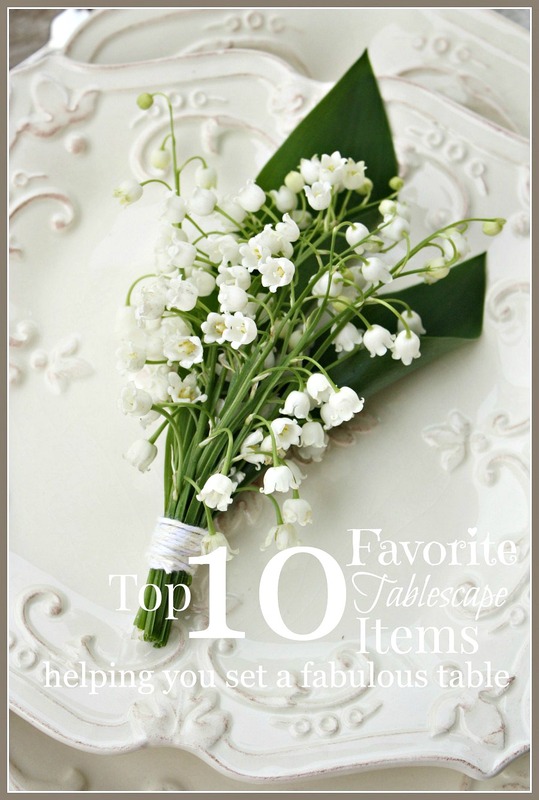 You can also use mismatched colored plates and a candlestick and spray paint it. But this would be a decorative cake plate stand only. Do not eat off of spray painted pieces. 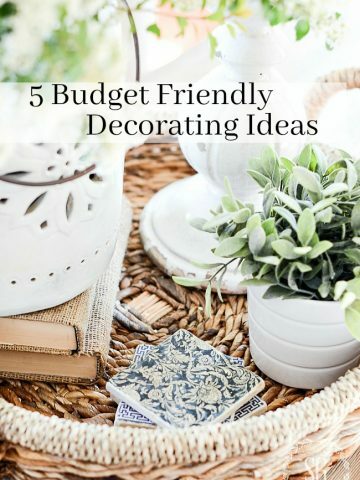 5 BUDGET FRIENDLY DECORATING IDEAS. I love cake plates, for some reason, and think I should have a bakery for the number of these I have! ha Although I have been intrigued in making these, yet instead have found them at thrift stores/rummage sales and scoop them up! Love your blog and can’t wait to read what you are sharing today! Thank you as always! Hi Rachel, do not put your cake pedestal in the dishwasher. I think the glue would be fine, but I mostly handwash those bigger items. Phyllis …. I sooo enjoy your blog!! 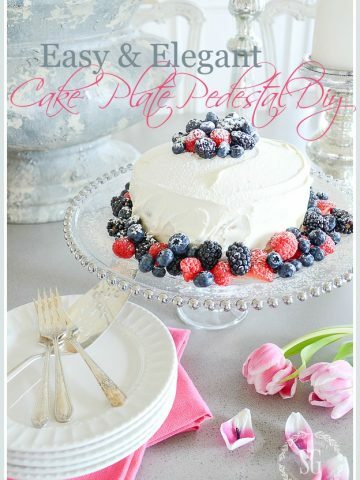 Love the easy pedestal tutorial…. different subject… you love “Airtable”… do you have a tutorial on how you use the app? You can find lots of help right on AirTable. I just dig in and learn as I go. I know just what you are talking about Diane! What a fabulous idea! Thanks for sharing! I love your idea and the tutorial! 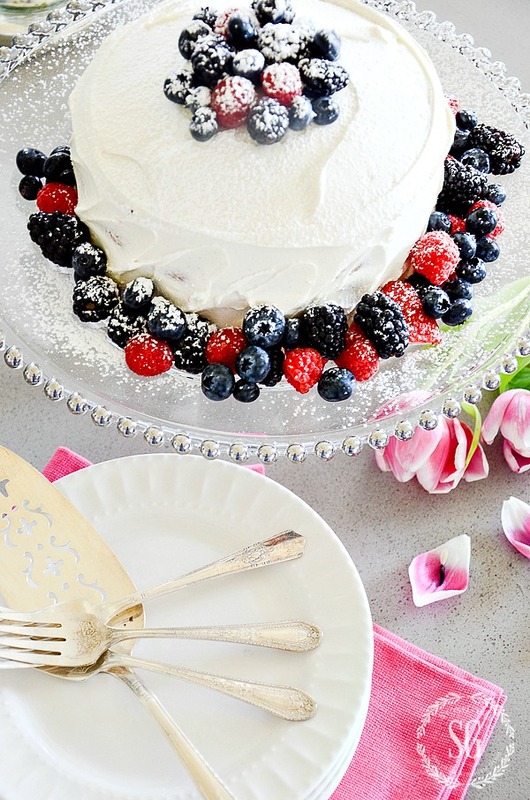 What a beautiful way to use for pretty cookies, cakes…I could see a blueberry cheesecake on a summery plate. Thanks!! Your cake plate is lovely… I , too have made several using various plates and dessert saucers… I also added the candle sticks to some of my teapots… the teapots were somewhat crowded in my curio cabinet, they were all the same height making it difficult to admire their individual beauty… It occurred to me the needed to be graduated heights.. The candle sticks at varying heights solved that issue… I enjoy your blog so much. I love this idea, I do it all the time! Sometimes when I don’t want it to be permanent I just use hot glue and then take it all apart when I am done. So right Shauna! You are amazing! Thanks for this tip! I am more drawn to the beautiful cake!!! If that is one of your recipes, please share!!! It’s Martha Stewart’s white cake recipe! That is the greatest idea i have heard in a long time. I love those very tall cake plates that are so expensive – this is a great bit of information!!!!!!!!!!! Always love your ideas. It’s so nice to see and read of others who enjoy the beauty and use of cake plates as much as I do. I have a few that I’ve picked up along the way, and you have inspired me to get them out and use them. I also am admiring that beautiful cake!!!! I searched in your recipes but couldn’t find it. Would you be willing to tell us about it? Thank you for taking the time to share with us! Hi Lucy, I have not shared the recipe for the cake. I use Marta Stewarts white cake recipe. Hope this helps. What a clever idea! And so beautiful, my mother used to tell me about getting that type of dish (although smaller) free in a box of detergent, many (many) years ago. Loved it then, love it now and thank you because you got my own ideas flowing! God Bless You, and BTW, thank you for your ministry, would love to live closer and have you teach me! Fabulous idea! Can’t wait to create one. Yvonne,you are so creative ! The cake plate turned out beautiful and such an easy craft. This is a beautiful cake stand!!! Great gift idea!!! I love the plate you have… Gorgeous! This is a very pretty project indeed but I’ll have to pass for the same two reasons I never use candles: a pair of energetic and ever curious 18 month old kittens. There’s a reason why one of their nicknames is The Flying Fellinis. As a former co-worker would say, they’d be on this like a pit bull on a pork chop. That is so creative! 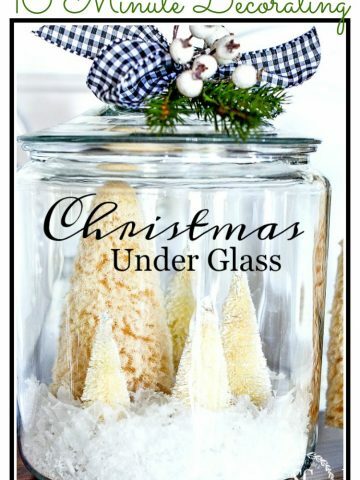 It would be a great idea to shop at thrift stores for plates and candlesticks in different materials, colors, etc… and make these as gifts for friends. Doing this today! Wonder if Gorilla Glue will do the trick? I’d get the non foaming kind. What a great idea!! Looks beautiful! I would have never thought you made it! Very clever!! Yvonne, this cake plate stand is so cool! I have several antique ones and this looks like the real deal —— I have also used this technique in another way. I got three different coordinated plates in three sizes (larger, medium, and small – like a small dessert) and one saucer. I also got two glass inexpensive candlesticks and a tube of e6000 glue I put the saucer upstide down and glued the largest plate to it, then the glass stick, then the medium plate, glass stick, and smallest plate. Voila! A three tiered colorful and one of a kind stand. It is my absolute favorite tiered stand for small cupcakes, cookies or appys, I always get rave reviews on the stand!! Thought I’d share. Thanks for sharing your take on this diy. Sounds beautiful Diane. Great idea. I think this with the cake will make great hostess gifts.